Swimming is great exercise. In fact, it’s like an aerobic workout that everyone, including seniors, can do without damage to the joints. It exercises the entire body and cardio system, while burning about the same number of calories that you would by running. While many of us may know that swimming is a good way to workout, we may not necessarily realize just how beneficial it can be for older adults. Those of us here at Freedom Home Care decided to look up some of the advantages of swimming and provide a list of what we found below. As we age, our bodies tend to lose bone density and strength. This can lead to a condition called osteoporosis. Age is not the only factor involved in the process bone density loss. A lack of exercise can cause to the same result. But according to research published in the Journal of Applied Physiology, studies showed a difference in femoral bone weight in control groups after swimming. Researchers found that while swimming may not be able to add density to the bones, it does help build muscle which contributes to bone formation. It also aids in developing bones that are younger, stronger and more flexible. Anyone with arthritis can attest that to the pain and stiffness that comes along with it. So, it’s no surprise that many seniors think twice about engaging in any type of exercise that might add to their discomfort. But a lack of movement can make things worse. Swimming actually helps offer joint support and pain relief, unlike many high impact exercises. Even a mild exercise routine – a few times a week –can increase flexibility and enhance range of motion, while helping to maintain bone strength. If your loved one is suffering from diabetes or heart disease, aerobic exercise should be part of their overall fitness routine Exerts say that swimming or any other type of water-based exercise done 2 ½ hours a week, can help lower the risk of chronic illness. Not only do people who engage in aquatic exercise improve their overall health, they also lower their risk of death by half. 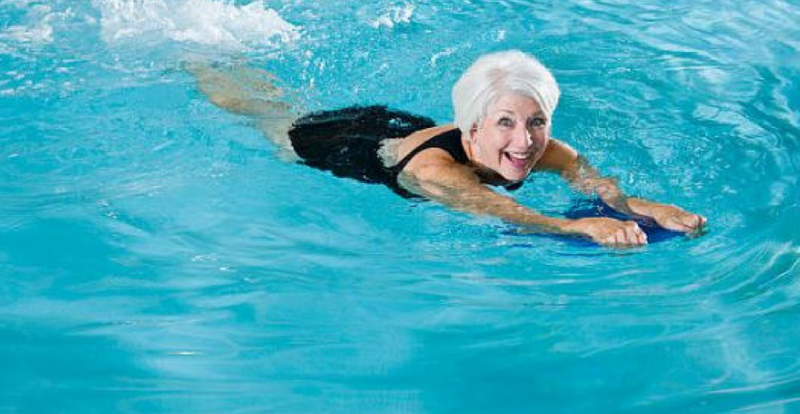 An improvement in physical health is only one of the benefits that swimming offers seniors. Studies show that water-based exercise also helps relieve decrease anxiety and negative mood swings. Over time, the number of muscle fibers in our bodies tend to reduce and shrink. Changes in the nervous system also contribute to a decrease in tone, lessening the ability of muscles to contract. Swimming provides the resistance the body needs because it requires the body to move in different directions as it adapts to the water’s push and pull. This supports greater range-of-motion in seniors, resulting in a natural increase in flexibility.